Are you seeking a divorce or legal separation? Is your divorce especially high-conflict or high-asset? Divorce can be an extremely difficult and emotional process. Don’t go through it alone. 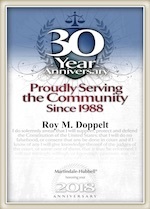 The San Diego Divorce attorneys at The Law Office of Doppelt and Forney, APLC have your back. We practice in all aspects of family law including divorce, legal separation and paternity. Call us to schedule your free consultation with an experienced attorney who will go over your case with you – free of charge. We represent clients in family law court in all of the court houses in San Diego County including downtown, Vista, Chula Vista and El Cajon. The world’s richest couple is calling it quits. After 25 years of marriage, Jeff and MacKenzie Bezos jointly announced that their marriage is coming to an end. The couple has four children together. Their divorce may be the most expensive divorce in history. The Bezoses live in a community property state (California is also a community property state), meaning all the wealth acquired during their marriage will be split equally between the two. The latest tally of his wealth is around $137 billion, based on estimates by both Forbes and Bloomberg, which means she could get as much as $66 billion, based on the value of the company today. However, to fund a settlement that big, Jeff would have to sell or pledge shares, which would dilute his ownership of the company. It is likely that MacKenzie would want the family fortune to continue to grow, according to CNBC. MacKenzie and Jeff met at an investment management firm, where MacKenzie was a research associate, and Jeff was a vice president. Jeff was the first person to interview MacKenzie, a fellow Princeton grad. They quickly married, and in 1994, they both quit their jobs and traveled to Seattle to found Amazon. MacKenzie was one of Amazon’s first employees. She was instrumental in the founding of Amazon. “I was there when he wrote the business plan, and worked with him and many others in a converted garage, the basement warehouse closet, the barbecue-scented offices, the Christmas-rush distribution centers, and the door-desk filled conference rooms in the early years of Amazon’s history” MacKenzie Bezos wrote. The divorce lawyers at The Law Office of Doppelt and Forney, APLC are here to help you. We will listen to your legal goals, understand your case, and treat you and your case with care and respect you may not find at a large firm. Call our office today at 858-312-8500 to schedule a free consultation with an experienced family law attorney. We are here to assist you with your divorce, legal separation, child custody and visitation, child support, spousal support, division of assets and debts, high-conflict and high-asset divorce, and more. Call to learn more about how we can help you.